PB Heat, LLC recently exhibited in the 2018 AHR Expo (International Air-Conditioning, Heating, Refrigerating Exposition) which took place January 22 – January 24 at McCormick Place, Chicago. The Expo – billed as the world’s largest HVACR marketplace – again set multiple all-time high records including attendance, number of exhibitors and square feet of exhibit space. Total attendance was recorded at over 72,000 with 169 countries represented. More than 2,100 companies exhibited products, solutions and innovations in over 534,000 square feet of exhibit space during the 2018 Expo, which was the 70th edition of the show. PB Heat, LLC, Bally, PA introduced two new Peerless® brand products at the AHR Expo: the Peerless® Combi gas boiler, a 95% AFUE heating and hot water combination boiler, and the Peerless® Partner® PV tank, a thermoplastic, maintenance-free indirect hot water tank. The Partner PV water heater is now available at Peerless® product distributors throughout the country; the PB Combi boiler will be available in the spring. 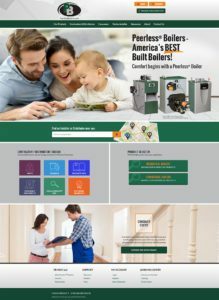 PB Heat, LLC also unveiled their newly updated and redesigned company website, PeerlessBoilers.com. The improved site features comprehensive product information including operating and installation manuals, ratings and various literature on each product, as well as helpful tools such as a “find an installer or wholesaler” module, a library of training videos and product pricing – all contained in an easy-to-use new “Contractor Toolbox”. The site’s new design is modern and bright and most information is easily found within a click or two. As is usually the tradition when the AHR Expo takes place in Chicago (because of its central location), PB Heat, LLC hosted their Manufacturer’s Representatives from throughout the U.S. and Canada for a sales meeting prior to the start of the Expo. Company executives discussed the two new products, company news and 2018 outlook, and presented a live demonstration of the new website to attending sales representatives. PB Heat, LLC Manufacturer’s Representatives also assisted with show floor booth duty to speak with the continuous flow of engineers, mechanical and HVAC contractors, facility managers and other types of customers seeking product information. PB Heat Representatives sell Peerless® products to a network of top distributors around the U.S. and Canada. The AHR Expo is co-sponsored each year by ASHRAE (American Society of Heating, Refrigerating and Air-Conditioning Engineers) and AHRI (Air-Conditioning, Heating, & Refrigeration Institute). Every two to three years, the show is held at the McCormick Place, Chicago, named for Colonel Robert R. McCormick who once served as editor and publisher of the Chicago Tribune. McCormick had the vision to build a large-scale permanent expo center in Chicago. His vision became reality in 1960 when the McCormick Center opened. Unfortunately, McCormick died in 1955 and never saw his dream and vision become reality. As it stands today, McCormick Place features 2.6 million square feet of exhibit hall space, 170 meeting rooms and assembly-style seating for 18,000 people. The expo hall attracts close to 3 million visitors each year. The 2019 AHR Expo will be held January 14 – 16 in Atlanta. The show is shaping up to be another success as exhibit space is already sold out.